last week we parted with a sad postcard of a biter dying after massacre on st. Valentines' day. Well they are tough fellas these biters so they got their claws sharpened, got some of their best boys together and set off for a revenge mission on the players' base. If you want to see them in action sweeping through a poorly protected oil expansion then check out the composition below. It was made by Albert, our fearless reporter from the Factorio planet. Now back to the Earth. Or more specifically Prague, yes that pretty city in the middle of Europe, where (among other wonderful things) the Factorio team is working day and night to deliver you the best build-factories-in-your-computer experience. And the day and night is not an overstatement. The "programming department" (me, kovarex and blue cube) usually works from something like 9 am to 7 pm. The working hours are VERY flexible. The part of the "working shift" is regular lunch with brainstorming at awesome local restaurant called The Carp in the honey (yeah no kidding - and they actually do serve the Carp in honey). The "art department" (Albert) has recently been in habit of working overnight. There are days when we chat in the morning after I wake up and he is just about to go to bed. 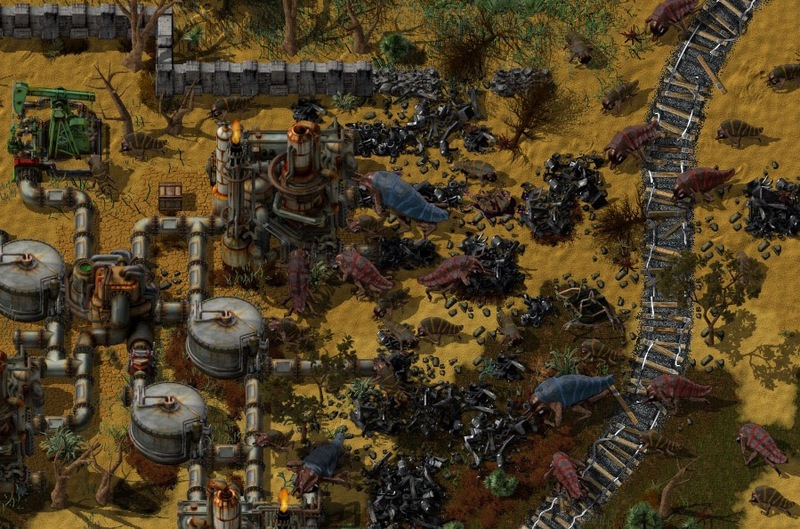 Well the result is that sometimes (during very hectic days) we have a 24h Factorio "development coverage". We do jokes about it, but it is definitely not something that we are proud or happy about. And actually it is getting better, in the early days we didn't do anything else then sit at home and code the game, nowadays the atmosphere is way more relaxed. Allright, so our efforts in the past week have been spent mostly on cutting down the massive list of bug reports that appeared after the Friday's 0.9 release. These efforts have culminated tonight by making the 0.9.1 bugfix release. While it fixes a lot of bugs we don't really expect it to become stable, namely after experiences from 0.7.x and 0.8.x generations :). Also some things are just not finished yet - like a migration of campaign or scenario pack to the new oil recipes. But if you were one of those who got corrupted saves from 0.9, chances are that this release will solve the problem for you. That is actually the reason why we tried to push it before the weekend. But as usual, no guarantees. No comments, no fun. Tell us what you think at our forum.